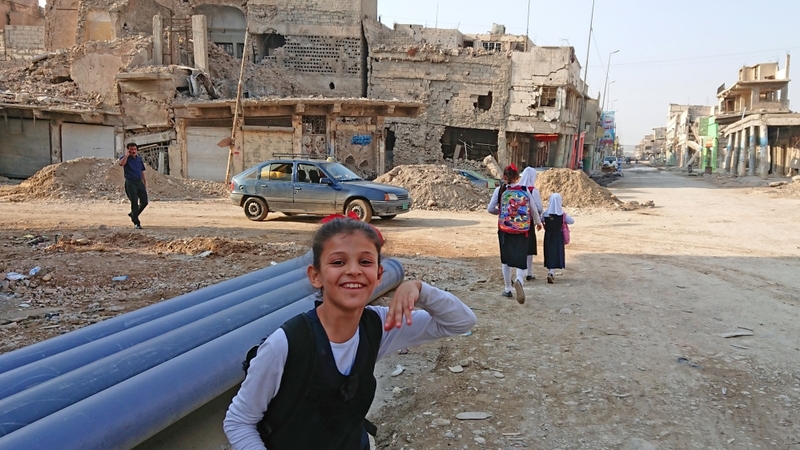 Nostalgia for Iraq's Baathist past lingers amid the ruins of Mosul's old city. Mosul, Iraq - Amid the rubble and devastation of the old city in west Mosul, it was difficult to imagine that Bulgaria would be the one thing local people would want to talk about the most. 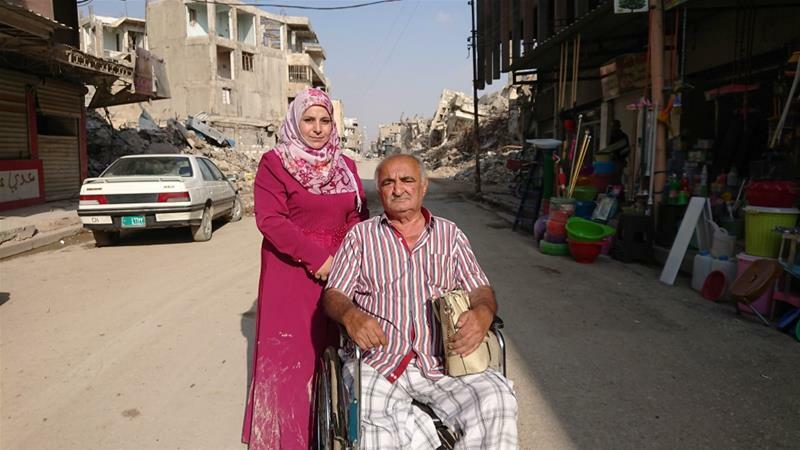 In the deserted Nineveh Street in al-Sa'aa (clock) neighbourhood, I met Adel Hassan, who had recently returned to his damaged home after having run out of money to pay rent for an apartment in the relatively less devastated east Mosul. He said he was the only one in his area to have come back. I asked about his life now, but he was curt in his replies. "Zein" (good) was the answer to each of my questions. When he found out I am from Bulgaria, he was eager to ask me one: "Is Bulgaria 'zein' now? Was it better before? Socialism was good?" "We had more dictatorship than socialism," I answered. He waved his hand, told me I had lost the plot, and departed with his young wife, Amira. Communist Bulgaria seemed to be remembered fondly by the few people (all middle-aged Muslim men) I could find to talk to in the empty streets of al-Sa'aa neighbourhood. "I went to Bulgaria in the 1980s. It was very beautiful and cheap," Faris Ibrahim told me. He had just re-opened his small shop, spending his own money to repair the damage that the fighting had caused last year. "I spent just 150 dinars on my trip to Bulgaria. This was the standard of living we enjoyed back then. We were the masters of the world. And where are we now - us, the masters of the world?" he said. Today that sum of money can buy you half a kilo of potatoes in Mosul. The time my interlocutors were reminiscing about was indeed a time of prosperity for the Nineveh province and its capital city. Mosul was the birthplace of a number of high-ranking Baathist officials and army generals, which ensured that it was well-provided for by the state. When oil prices shot up after the 1973 oil crisis, Saddam Hussein's regime used part of the revenue to build vast infrastructure projects and improve education. In the 1980s, while the war with Iran was devastating the southeast of the country, especially Basra, the northwest continued to prosper. Major infrastructural projects were still being built, including the Mosul Dam and the Fifth Bridge on the Tigris river. Throughout this time, Baathist Iraq kept close relations with the Eastern bloc, especially Bulgaria, under the patronage of the Soviet Union. Cultural, educational, military and trade relations flourished. 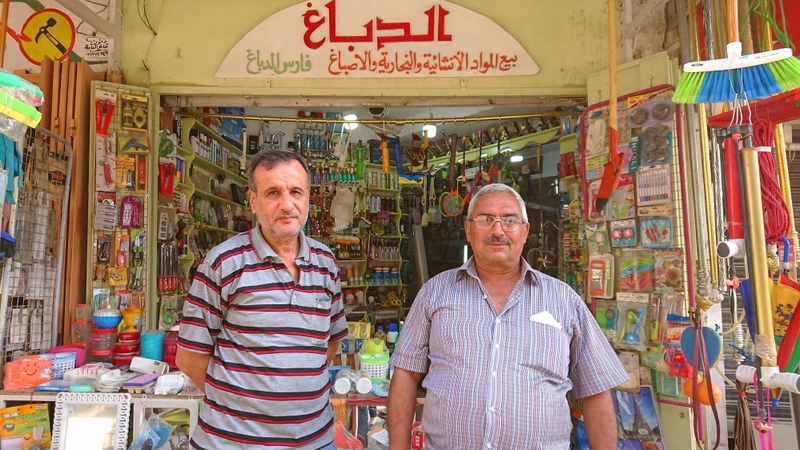 The local economy was strong enough for many Muslawis (Mosul residents) like Ibrahim to afford the day-and-a-half car trip through Turkey to Bulgaria. Back then, the Iraqi passport used to open up many doors in the Eastern bloc and beyond and the Iraqi dinar was stronger than the US dollar. Today, some of the Iraqis who do make it to Bulgaria are refugees seeking to reach Western Europe and unlike the communist regime, the current Bulgarian government has hardly made them feel welcome. Iraqi refugees like all others have endured the violent pushback policies of the Bulgarian state at its southern border with Turkey. For example, in January 2015, after 12 Iraqi Yazidi men were severely beaten and robbed during a pushback by the Bulgarian border police, two of them froze to death near the border. Since the early 2000s, Iraqi-Bulgarian relations also have a new patron. In 2003, shortly after the US invasion, the Bulgarian government, which at that time was eager to earn favour with Washington and join NATO, sent hundreds of Bulgarian troops to back the war effort. The justification the Bulgarian government gave for the deployment of Bulgarian troops for a mission the United Nations had not approved was that it was seeking to get back the $3.5bn in debt Iraq had accumulated buying Bulgarian weapons during the 1980s and secure reconstruction contracts for Bulgarian firms. It got neither. In 2007, the Bulgarian government - under pressure from the Bush administration - cancelled 90 percent of the debt. The following year the mission of the Bulgarian troops ended; 13 of them died during the deployment. The nostalgia for the prosperity and security under the Baathist regime I saw in Iraq was not limited to Sunni Muslims alone. Older Christians I talked to in the nearby Christian-majority city of Bakhdida also shared similar views, and so did individual Baghdad-educated Kurds (albeit not so directly). Reminiscing about the old days is perhaps one way to process the shocking devastation that stares at you at every corner of Mosul's old city. Intense air raids by the US-led coalition helped to destroy whatever historical heritage the Islamic State of Iraq and the Levant (ISIL, also known as ISIS) group had not, along with civilian homes, schools, hospitals, etc. Once a vibrant, diverse and prosperous area, the old city is now but a shadow of its old self. "This used to be a busy shopping street. To the right and to the left, all these were shops," Joheir Halil told me. "Now, it's all destroyed." Just three shops were open in the area - one of them belonging to his friend Ibrahim. Halil's own carpentry shop has also been damaged and he hasn't been able to reopen it yet. He had worked in it for four decades, renting the space from the church across the street. "We used to run and play together here in this street 'til 3am in the summers - us, Muslim kids, and the Christian kids," recalled Halil. When ISIL captured the city in June 2014, it forced Christians - who had lived there for almost two millennia - to choose between converting to Islam and leaving. Christian families chose the latter. Today, a year and a half after the liberation of Mosul, Halil knows of only one Christian who has returned to the old city. "This used to be their city," he murmured under his breath. Across the street, the Latin Church still stands, the crosses at the top of its two domes missing and its famous clock - which gave the name to the neighbourhood - removed. Underneath its wall, a big sign of the ICRC warns people of the dangers of mines and unexploded ordinance. 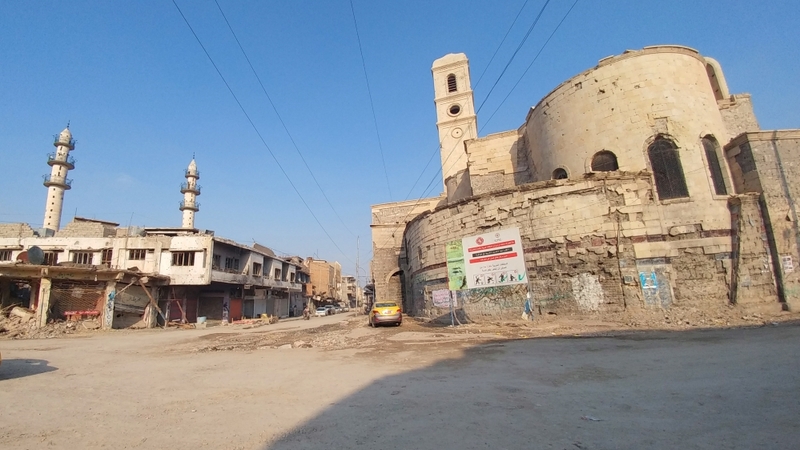 Just a few hundred metres away are the remains of al-Nuri Mosque, in which 2014 Abu Bakr al-Baghdadi announced the creation of the ISIL caliphate. Apart from the lack of security and the trauma of what had happened, Christian, Muslim and other residents of the old city are reluctant to return also because of the absence of basic services. "There is no electricity, no water, no services. When it rains, everything floods because there is no sewage," said Ibrahim. Aid and reconstruction are slow to come to the old city. Both Ibrahim and Halil say that local residents have not received much outside help so far, although efforts to clear out the rubble and mend the roads could be seen. According to Dr Muzahim al-Khayat, president of Nineveh University and head of the Reconstruction Team of Nineveh province, reconstruction of residential areas is not the first priority of the local authorities and international aid agencies. In a phone conversation, he said that for now, the main focus of the reconstruction effort is infrastructure and then universities, schools and hospitals. A UNDP project for the rehabilitation of 4,500 partially destroyed homes in the old city is likely to start over the next year, he said. Reconstruction will be a slow process in Mosul and its old city. If the plan which Dr al-Khayat and his colleagues had submitted to the government is fully implemented, it would take more than eight years to restore the city. But even then Mosul is unlikely to reach the prosperity it once enjoyed. "There is no future, no hope here," Ibrahim said. 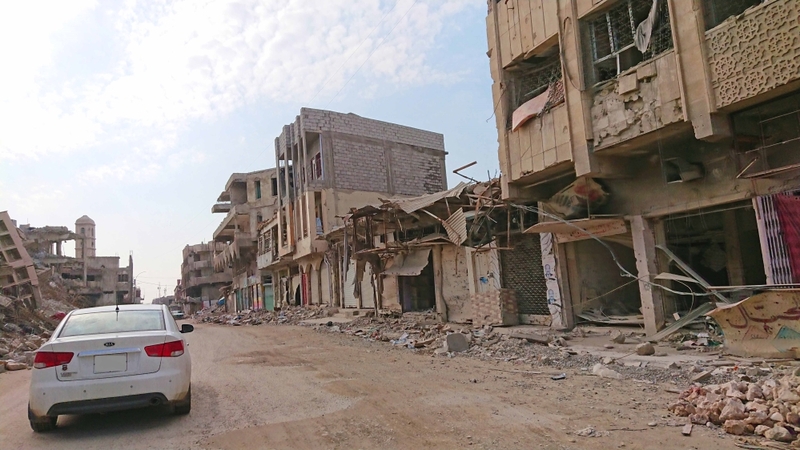 Observers have expressed concern that the growing grievances over the lack of reconstruction in some areas could feed resentment among local people and encourage them to join ISIL's remnants. Asked whether he fears ISIL returning, Ibrahim was categorical: "It will not come back. We've already seen this film. It has ended." A day after this conversation, a bomb exploded at a busy market in Mosul's Qayyara district, killing six and injuring more than 30.